Diwali or Deepvali. The Hindu festival of lights. In any major city in India it is a spectacle. Stores, hotels almost any building is lit up with strings of lights, white or multi-colored. It doesn’t matter as long as there’s lots. In Jaipur, lights criss-cross the street. The jewelry stores are usually the most elaborately decorated. Fireworks are continuously exploded. They are the loudest I’ve ever heard. I think I actually experienced permanent hearing loss in my left ear due to being too close to what I think was a dynamite grade bomb on my last trip to Jaipur. This November I arrived in Kathmandu, Nepal just in time for the start of this year’s Diwali. Wherever you are in the world Diwali is a five day festival starting with the first or main festival night. A puja, prayers and celebration of Lakshmi, goddess of wealth and prosperity. In the Thamel section tourist area of Kathmandu the store owners decorated their entrances with trails of lights and colored powders for Lakshmi. Beautifully displayed. Clean sidewalks and proud merchants. Lower key than my Jaipur experience. But nice. After the puja was done at home it seemed most families came out to walk through the streets and see the beautiful displays everywhere. I especially enjoyed walking around the area close to Kathmandu’s Durbar Square. This is where locals do most of their everyday shopping, eating, worshipping and socializing. 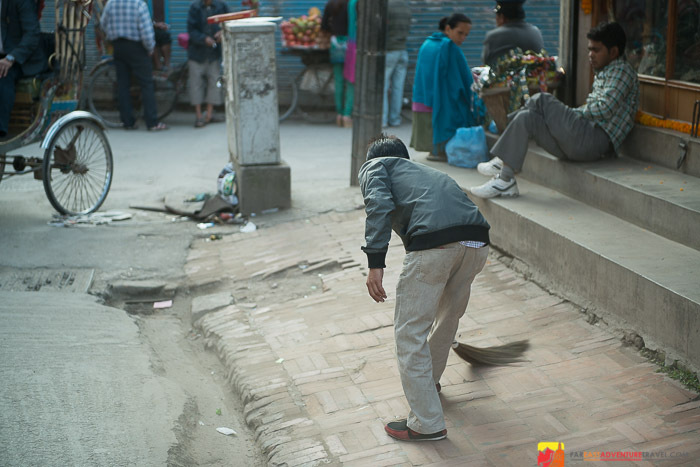 It’s a wonderful place to see everyday life and one of the most authentic areas around Kathmandu proper. You won’t see any outdoor stores or flute peddlars here. Durbar Square still seemed like it was the busiest area of all. Tourists were everywhere but this is still a place of worship for Nepali’s as well as a trading area. But no fireworks to be heard. This was definitely a different Diwali then the one I experienced a year ago in Jaipur. For me the real joy of this festival is watching everyone admiring the lights and decorations and being in the company of their family and friends. The streets are full of smiles. Pure happiness. I didn’t miss the fireworks. Note:If you are planning on coming to India or Nepal for Diwali keep in mind transportation costs such as car hires or taxis can double or triple during festival time. Check with your agent or tour operator. You may want to book in advance.